In 1976, Robert Levenson and John Gottman teamed up to combine the study of emotion with psycho-physiological measurement and a video-recall method that gave us rating dial measures (still applying game theory) of how people felt during conflict. That was the new way of getting the “talk table” numbers. The research also became longitudinal. They made no predictions in the first study, but they were interested in a measure of “physiological linkage,” because a prior study showed that the skin conductance of two nurses was correlated only if they disliked one another. They thought that might be linked to negative affect in couples. Indeed it was. They were also amazed that in their first study with 30 couples they were able to “predict” the change in marital satisfaction almost perfectly with their physiological measures. The results were that the more physiologically aroused couples were in all channels (heart rate, skin conductance, gross motor activity, and blood velocity) the more their marriages deteriorated in happiness over a three-year period, even controlling the initial level of marital satisfaction). The rating dial and their observational coding of the interaction also “predicted” changes in relationship satisfaction. They had never seen such large correlations in their data. Furthermore, they had preceded the conflict conversation with a reunion conversation in which couples talked about the events of their day before the conflict discussion, and they had followed the conflict discussion with a positive topic. What was amazing was that harsh startup by women in the conflict discussion was predictable by the male partner’s disinterest or irritability in the events of the day discussion. They had then discovered that the quality of the couple’s friendship, especially as maintained by men, was critical in understanding conflict. Furthermore, the ability to rebound from conflict to the positive conversation became a marker of emotion regulation ability of couples. Both Robert Levenson and John Gottman had discovered Paul Ekman and Wallace Friesen’s Facial Affect Coding System (FACS), and Gottman subsequently developed the Specific Affect Coding System (SPAFF), which was an integration of FACS and earlier systems in the Gottman lab. The SPAFF became the main system that Gottman used to code couples’ interaction. At first it took 25 hours to code 15 minutes of interaction, but later Gottman was able to get the same coding done in just 45 minutes, with no loss of reliability. Gottman also began applying time-series analysis to the analysis of interaction data. He wrote a book on time-series analysis to explain these methods to psychologists, and developed some new methods for analyzing dominance and bidirectionality with James Ringland. Gottman and Levenson then got their first grant together and began attempting to replicate their observations from the first study. The subsequent studies that they conducted in their labs with their colleagues eventually spanned the entire life course, the longest following couples for 20 years in Levenson’s Berkeley lab. The Gottman lab at the University of Illinois also studied the linkages between marital interaction, parenting, and children’s social development (with Lynn Katz), and later at the University of Washington involved studying these linkages with infants (with Alyson Shapiro). Gottman developed the concept of Meta-Emotion, which is how people feel about emotion, specific emotions (like anger) and emotional expression and emotional understanding in general. Meta-emotion mismatches between parents in that study predicted divorce with 80% accuracy. Gottman and Levenson discovered that couples interaction had enormous stability over time (about 80% stability in conflict discussions separated by 3 years). They also discovered that most relationship problems (69%) never get resolved but are “perpetual” problems based on personality differences between partners. In seven longitudinal studies, one with violent couples (with Neil Jacobson), the predictions replicated. Dr. John Gottman could predict whether a couple would divorce with an average of over 90% accuracy, across studies using the ratio of positive to negative SPAFF codes, the Four Horsemen of the Apocalypse (Criticism, Defensiveness, Contempt, and Stonewalling), physiology, the rating dial, and an interview we devised, the Oral History Interview, as coded by Kim Buehlman’s coding system. Dr. John Gottman could predict whether or not their stable couples would be happy or unhappy using measures of positive affect during conflict, which Jim Coan and Dr. John Gottman discovered was used not randomly but to physiologically soothe the partner. Dr. John Gottman also discovered that men accepting influence from women was predictive of happy and stable marriages. Bob Levenson also discovered that humor was physiologically soothing, that empathy had a physiological substrate (with Anna Ruef) using the rating dial. 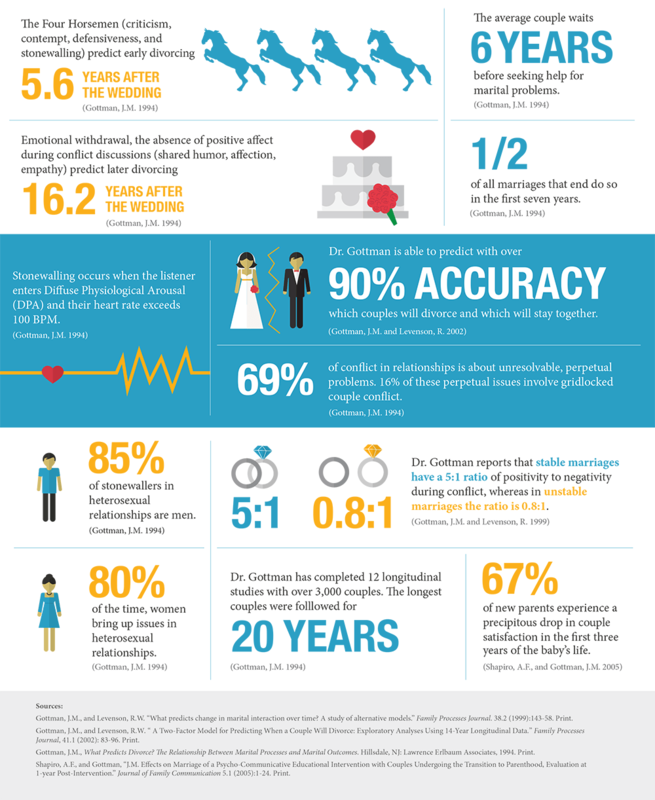 The infographic below highlights some of Dr. John Gottman’s most notable research findings on marriage and couple relationships.